Hi, Friends! It’s Head Hen Lucinda here. I don’t know what it’s like where you live, but here on our farm in La Belle, Missouri, it’s hot as blazes! In honor of the DOG days of summer, I wanted to give a little “bark out” to a very critical member of the family farm staff. I’m talking about our pooches of course! It’s time we give these four-legged farm hands the credit they deserve, and maybe a few extra belly rubs! Plus, it gives us an excuse to ooh and ahhh over this adorable picture of one of our junior farmers (aka my baby girl) with her pup! When you raise animals outdoors where they roam on grass the way nature intended, you have to be mindful of predators such as racoons, opossums, coyotes, wild boars and occasionally here in Missouri – a cougar. With the sheep, we use portable net fencing and the chickens have movable chicken tractors but still, that is not always enough to keep the predators deterred. Alot of the family farmers in the Moink community rely on a Great Pyrenees or two to help guard our pasture-raised animals, myself included. Though this breed has a smart, patient and calm temperament, they are natural protectors, and all 85+ pounds of them will spring into action if needed. In fact, these majestic working dogs were originally bred to deter sheep-stealing wolves and other predators. Don’t let their thick fluffy coats and mellow personalities fool you – these dogs are loyal and vigilant guardians of their families and their flocks. I mean, we all need a Sasha in our lives, don’t we? Somebody who stays all steadfast and zen, but then goes postal when somebody tries to mess with us? Just sayin’! On a sustainable family farm, our dogs are even more than a loyal pet. They’re a critical member of our team and official keepers of the flock! They make it possible for Moink’s partners to raise their animals without confinement buildings and feedlots. 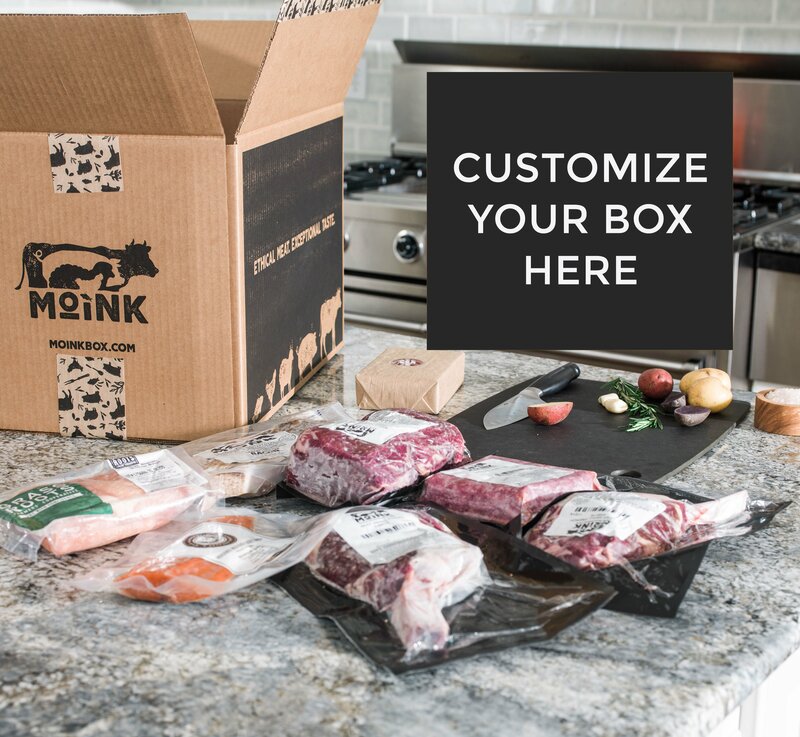 Try a Moink Box today! Lucy my gosh Marv n I just ate the ribeye! Holy cow ive never tasted a steak that was thick as that was and how tender it was. Wonderful. Thanks to your brother and Jody for giving me this birthday present of Moink meat! You def have a new customer. I just cannot eat meat from the store and havent for a very long time! You guys are the bomb! Thanks again!